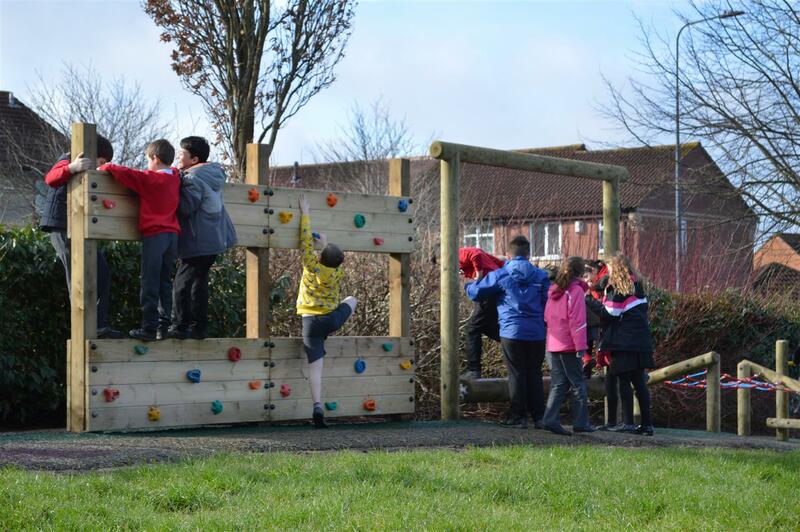 Our Outdoor Learning Consultant and Director, James Collis-Pritchard, worked with Bailey’s Court Primary School to create an amazing adventure play zone within their playground environment. 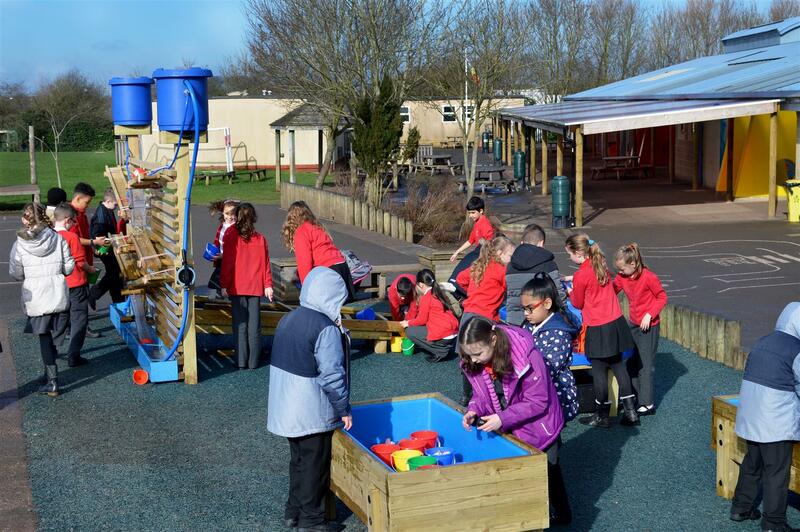 Before our development, the school was having issues with a raised area which sloped away from the centre of the playground. 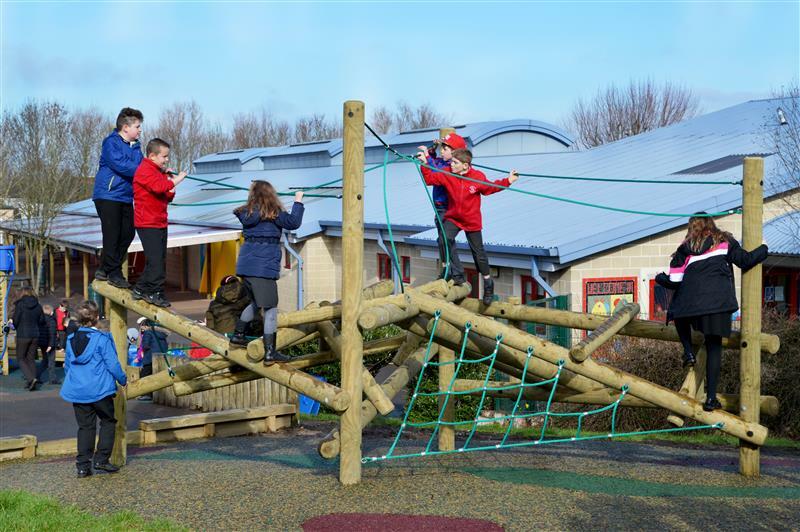 Due to the huge incline, it was a becoming challenging area for the teachers to manage or use for outdoor learning activities. It also became potentially hazardous during wet weather conditions, making the entire sloped area unusable for large parts of the year. 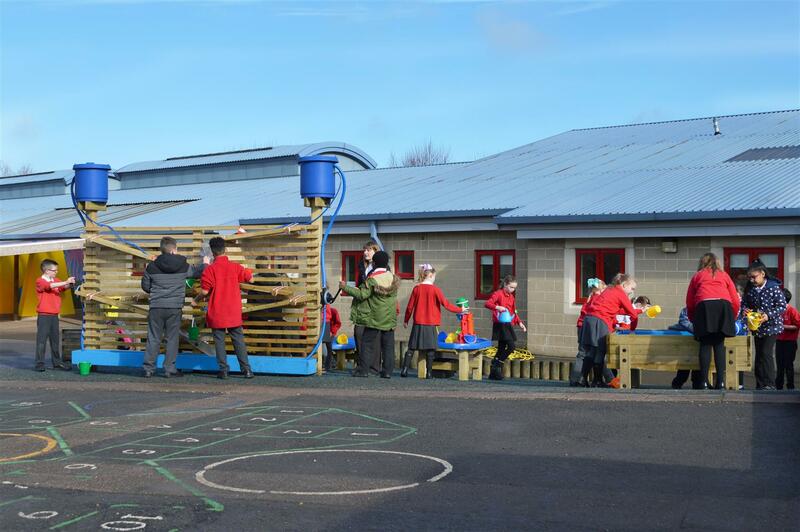 Moreover, the school identified that their playground lacked active resources to help improve children’s physical development. 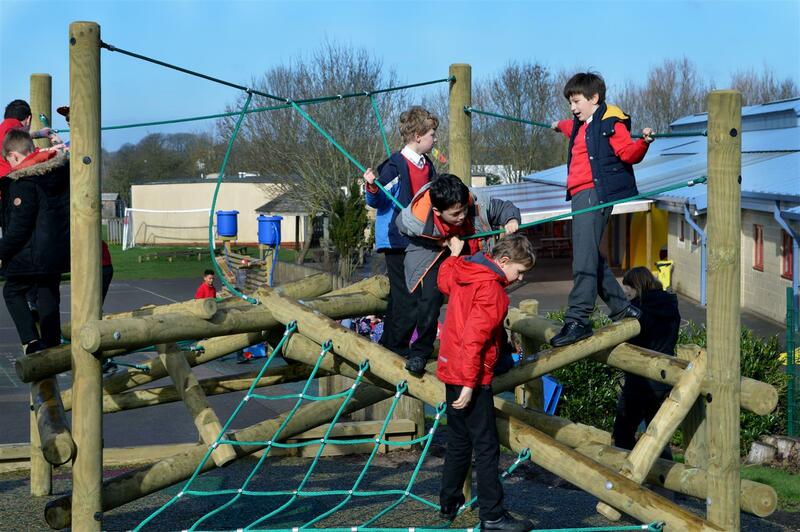 Taking these factors into consideration, we created an amazing all-weather play environment brimming with adventurous play resources and exciting playground equipment. 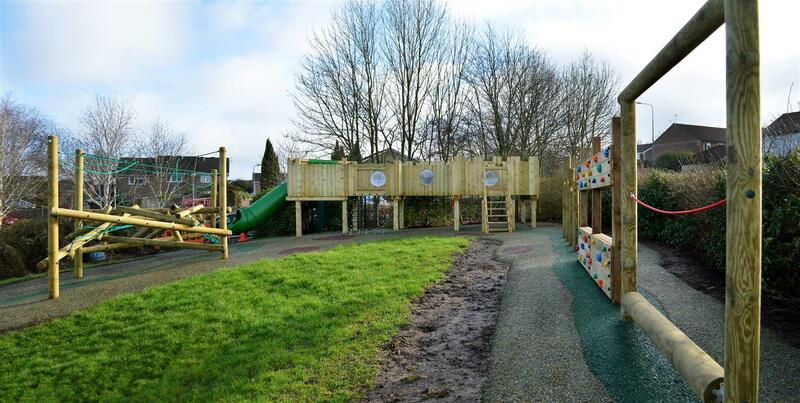 To make the slope safe and useable in all weathers, we re-surfaced and covered the area with our Playbond Safety Surfacing. 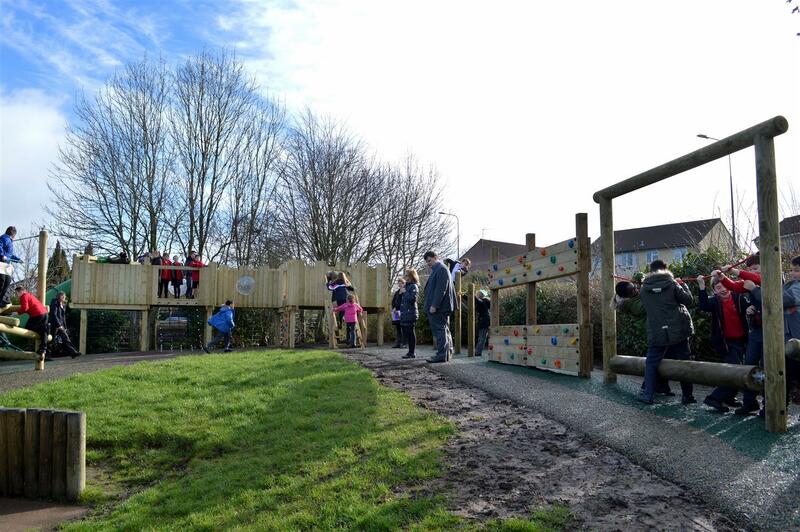 The area will never be ‘out of bounds’ and will protect children from falls during safe risk taking. 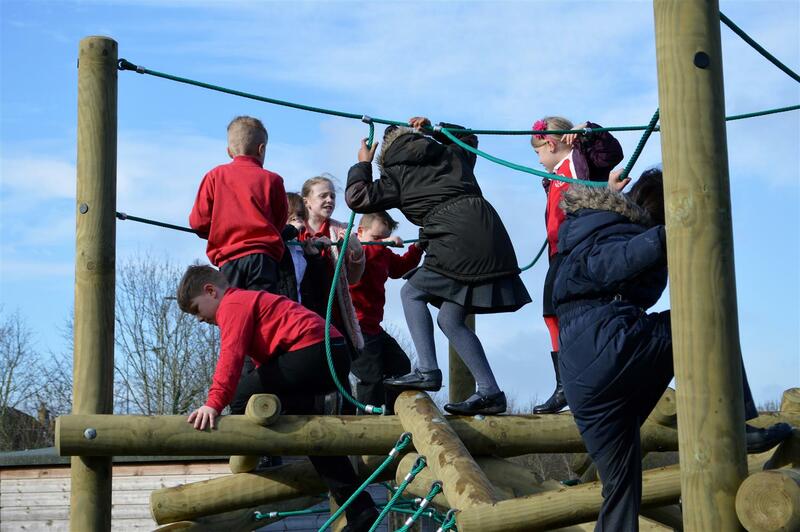 With the school lacking in active play equipment, we decided to turn the entire slope into an adventure play zone with both linear and open ended challenges. 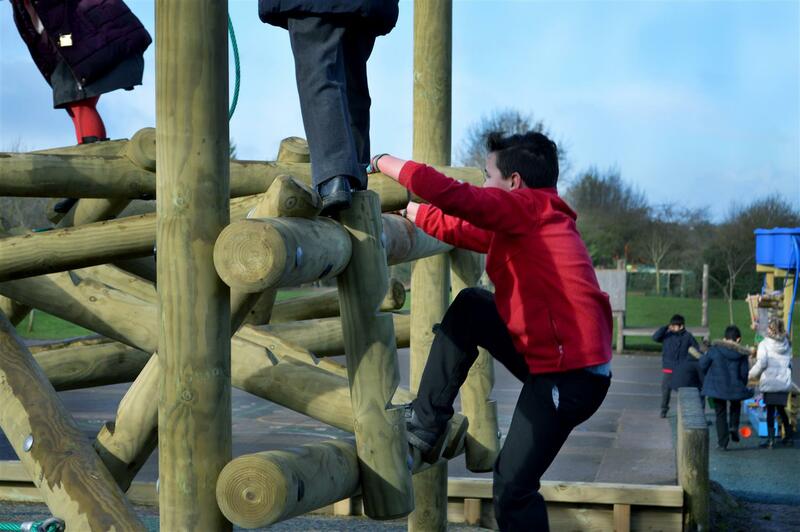 Log Weaver – a balance beam with vertical logs either side, creating a twisting and balancing challenge. 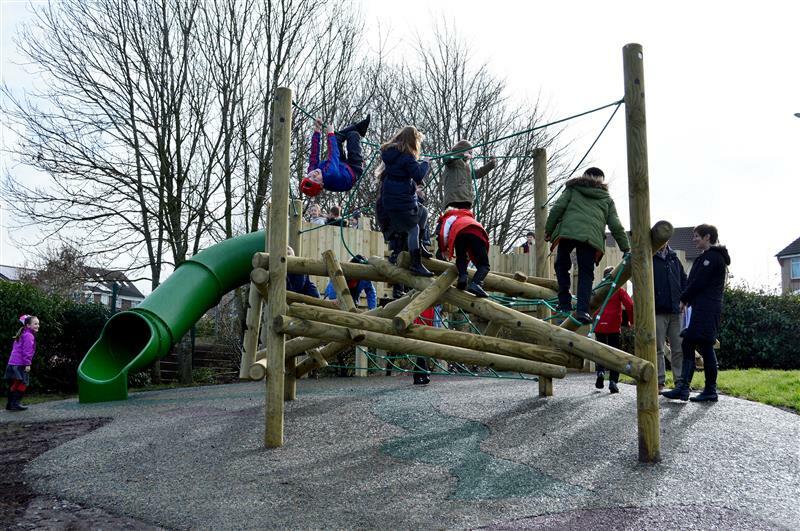 Tightrope Bridge – this resource focusing on children’s foot placement and balance. 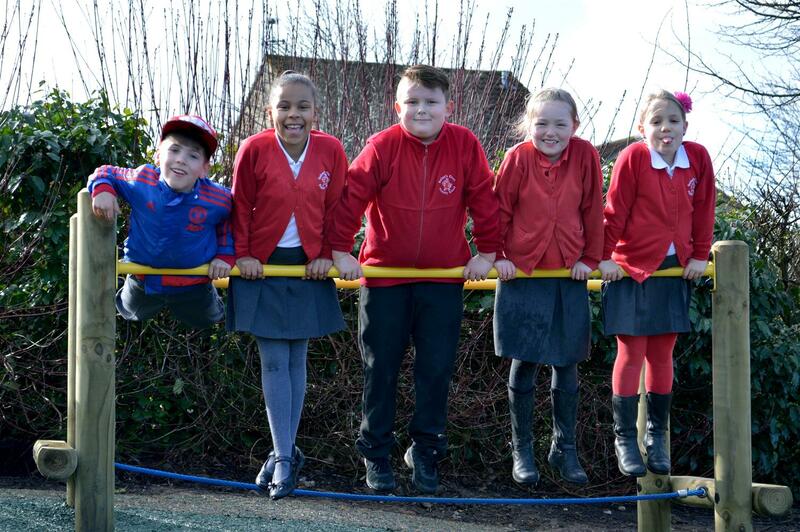 Twist Net Bridge – a net crossing challenge that works on children’s coordination and core stability. Rocking Log Traverse – a large beam that spins eccentrically, truly testing children’s stability, lower body strength and footwork. 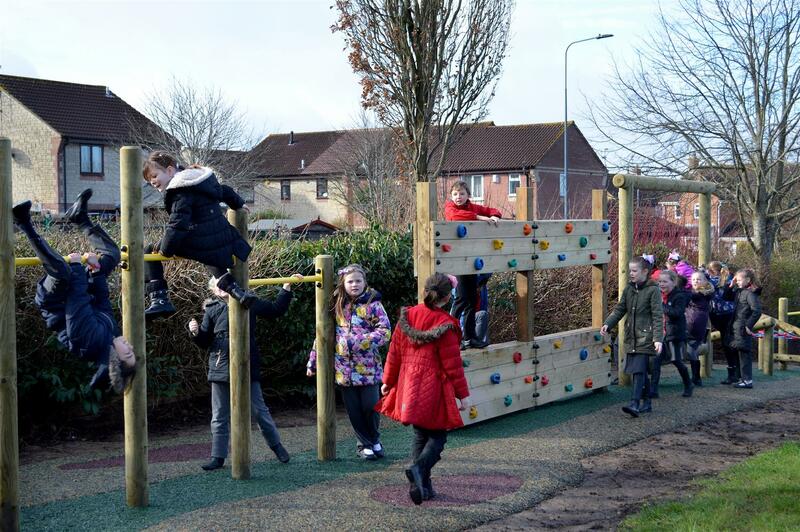 Double-sided Timber Climbing Wall – a traversing climbing wall constructed with over 50 climbing holds that develops children’s fine motor skills, climbing ability, upper/lower body strength and flexibility. Pull Up Bars – three different sized pull up bars for upper body strength. 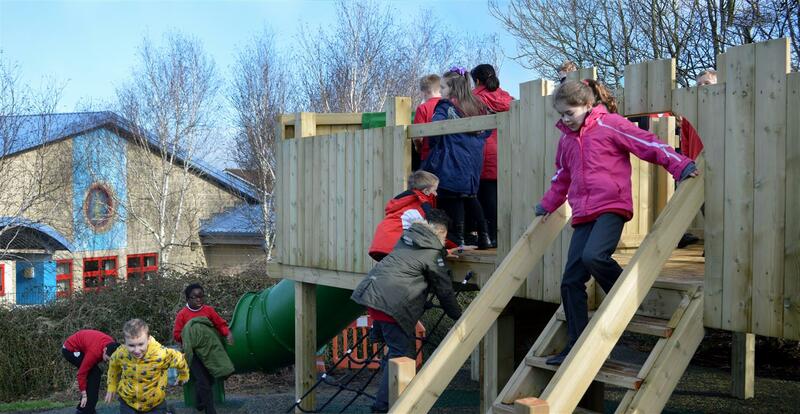 At the very top of the slope, we added our huge Langley Play Castle to inspire both active and imaginative play. The castle will inspire role play activities as children play pretend their favourite fairy tales and stories. There is also plenty of space on top of the castle for storytelling and space underneath for den-making. The children have three ways of entering the Castle all depending on confidence and skill level and four ways of exiting. 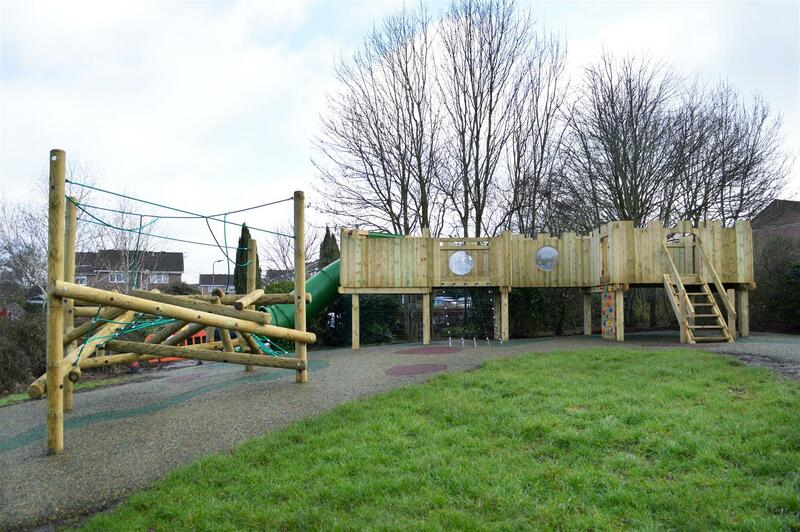 Moreover, the inclusion of the bubble windows will allow children to further use their imagination as they look out onto the rest of the playground creating new worlds and imaginative environments. 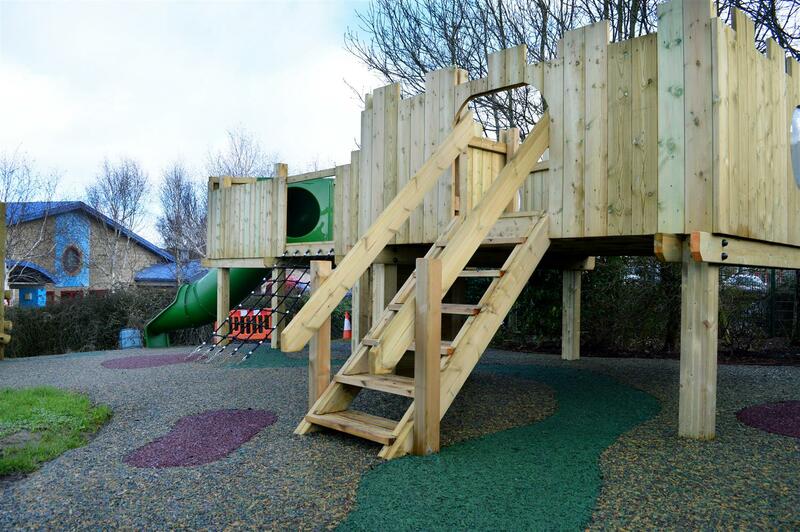 On the next side of the slope, we installed our massive Skiddaw Log Climber which is one of the biggest we have on offer. 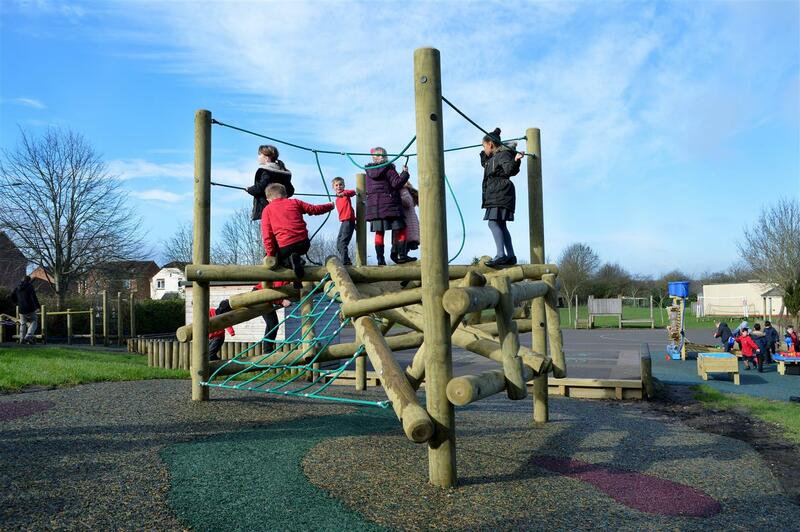 It’s a fantastic climbing resource for developing upper and lower body strength, core stability, balance, grip and grasp and fine motor skills. 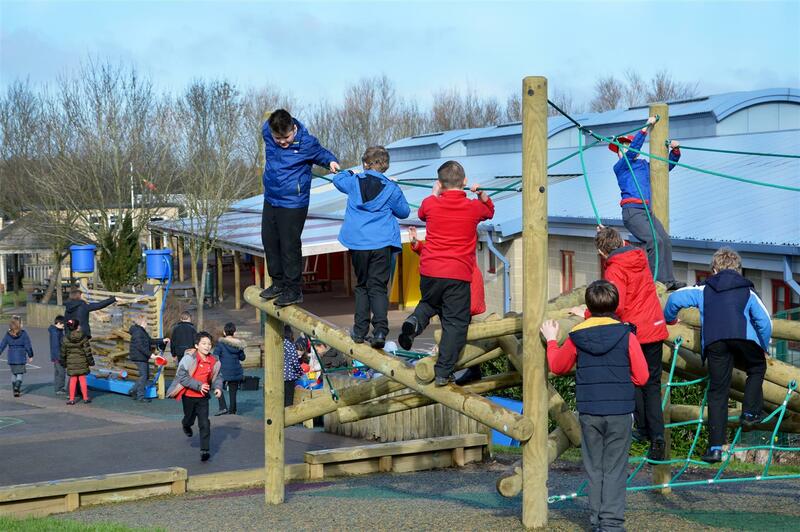 With multiple access points, there is no obvious way for the children to enter the Skiddaw challenge making it more exiting. 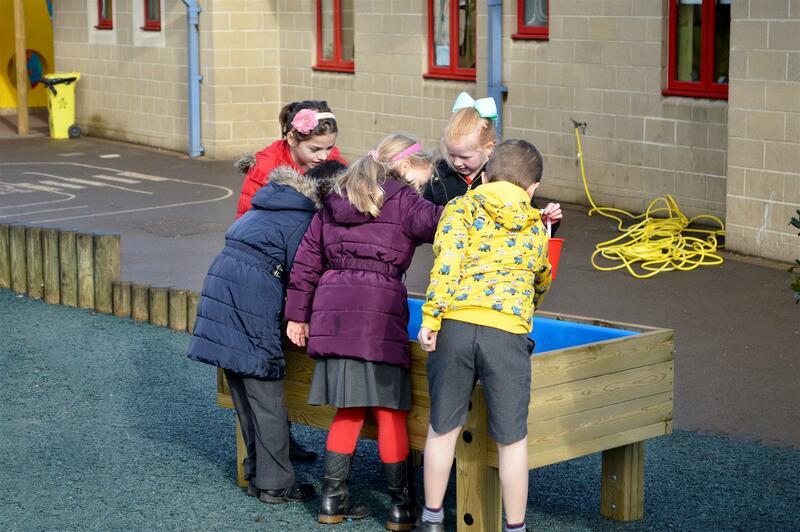 At the bottom of the sloped area, we decided to create a Water Play Zone. This zone includes our Water Wall with Damming Station attached to encourage teamwork and investigative play. 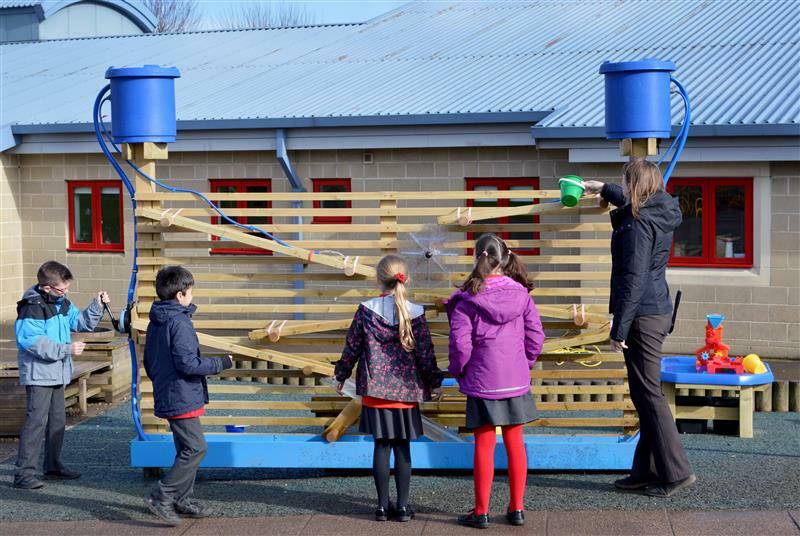 It also includes two Water Tables and Tuff Spot Tables for further messy play and learning. 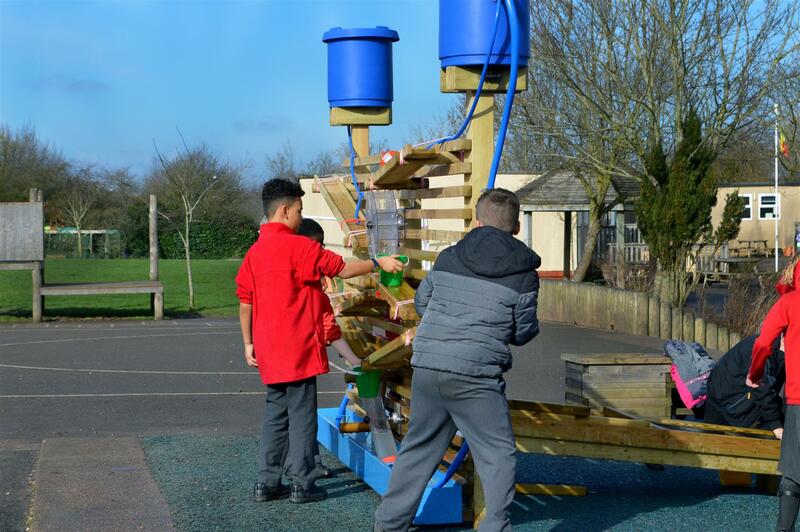 These resources can easily be linked with each other, making it perfect for self-selective play. 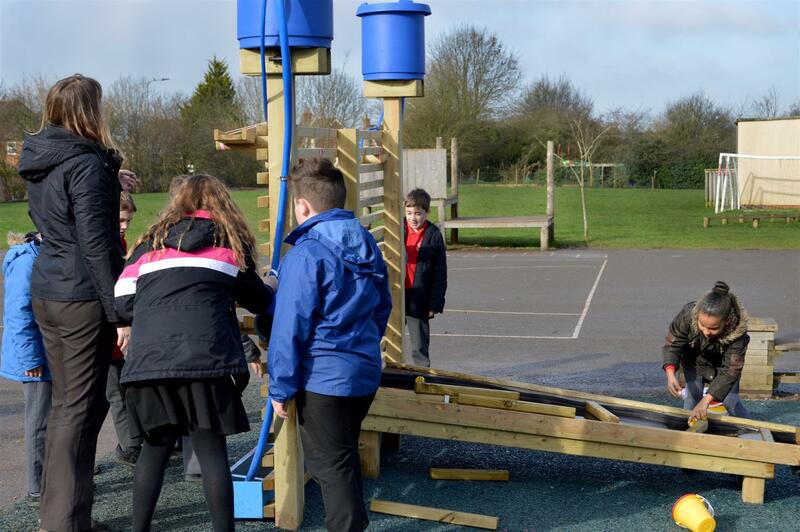 One set of children will pump water from the Water Wall while another team must work together to build dams to stop the flow of water. 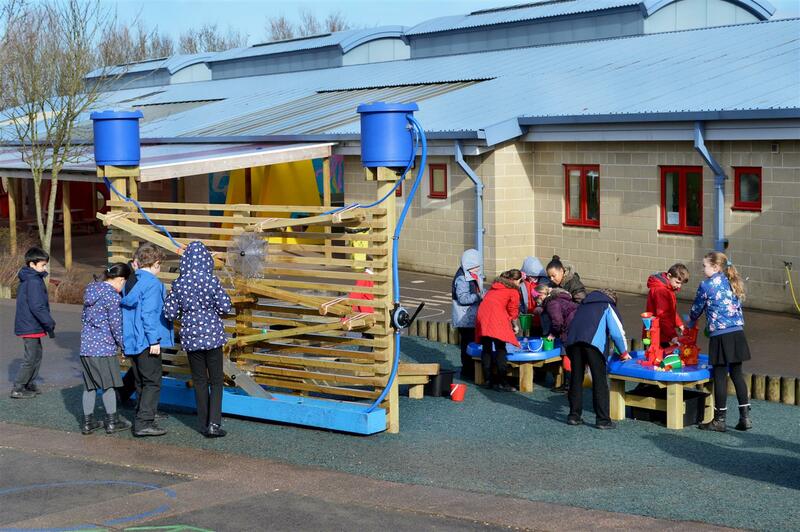 The children can also easily collect water from the Damming Station and transfer it to either the Water Table or Tuff Spot Table for further investigative learning. 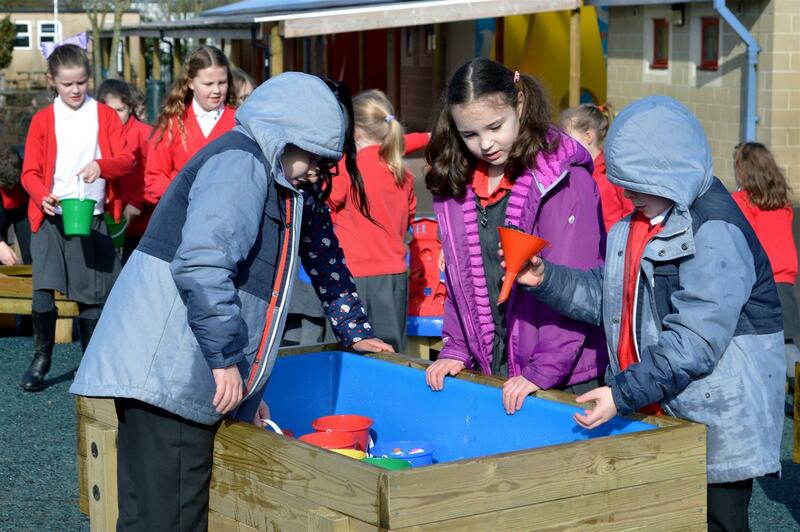 Teachers can also link the curriculum to these resources to help educate children about the water cycle, source to mouth, water recycling, kinetic energy, mathematics and many other topics. Also, feel free to ask any questions to our Live Chat host, Liz, who will be more than happy to answer any queries you may have.